Useful, tangible items imprinted with an advertiser’s name, logo or message. 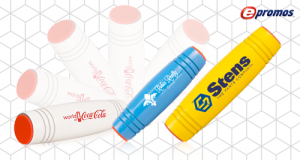 The perfect medium to increase brand awareness, promotional products are an incredibly powerful marketing tool since they allow a brand to connect with consumers by engaging their senses. As one of the only forms of advertising that allows consumers to interact with a brand on a physical level, promotional products often create a more memorable brand experience. 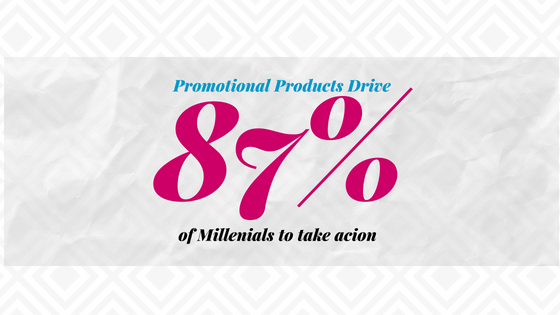 Here are just a few (of many) impressive statistics that were highlighted during Promotional Products Work Week. 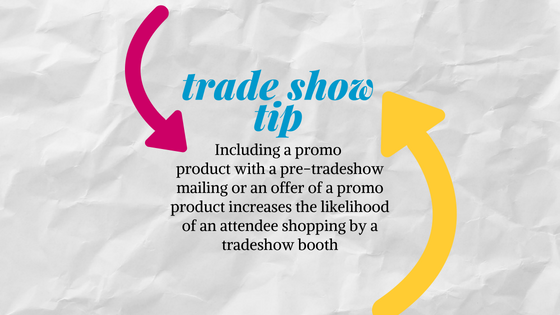 This annual event is created by the Promotional Products Association International (PPAI), and is designed to shed light on the effectiveness of promo items. Isn’t that amazing? 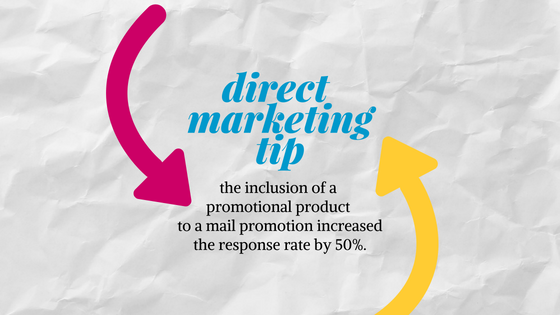 Promotional Products should ALWAYS be a part of your marketing mix. Pretty cool, right!?! Interested in marketing to millenials? Click here. Especially their favorites. Mine in particular: favorite pen, favorite bring-your-lunch-to-work bag, favorite t-shirt (for the past 7 years), and favorite umbrella. They also happen to be surprisingly affordable – and, people love receiving them. Trust us, it’s worth it (pre-show). Looking to connect AT the show? Click here. This years note-worthy choice to include with your next Direct Marketing campaign: Webcam covers. They can be mounted directly to a post card (without much additional weight), and show that you value your clients privacy. That’s right. 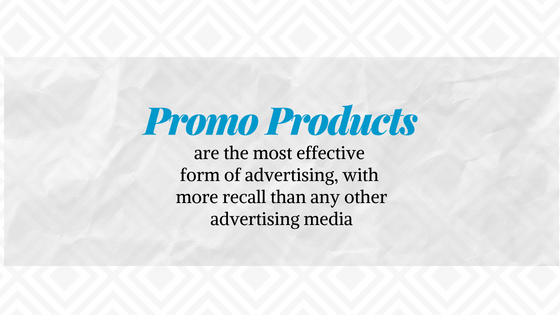 People remember promotional items, more so (long-term) than any other form of advertising. That’s because when given a useful item, people connect with that item and remember what’s written on it. 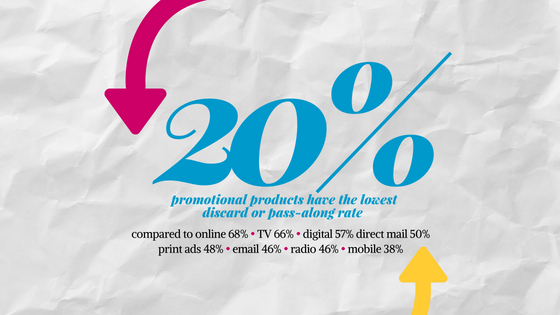 Promotional Products really do work. Call us today, The Promo Know-How People and let us show you how to choose the right item to support your brand. Athleisure fashion with warmth plus many extras! Athleisure is the latest buzzword in the fashion industry, but it just may be more than a buzzword. Athleisure is here to stay because the gym-to-office trend is versatile, comfortable and great looking. Your logo will be seen in more places than ever before: at the gym, office, mall and even at lunch. It is now totally acceptable to wear your athletic-inspired outfit all day, every day because it perfectly fits your busy and active lifestyle! If you want a jacket that’s an athletic combination of warmth and coziness with eye-catching details, the Tremblant Jacket is a wonderful example of the athleisure look as it easily transitions from the work place to after work activities. This jacket is comfortable like a best-loved sweater, plus its great functional features include a zippered upper chest pocket with ample and secure storage for accessories, thumb exits in the sleeves, two zipper hand side pockets and an audio port and cord guide for earbuds. The design includes a drop tail, when the hem length of the garment is longer in the back, for added coverage. This retail-inspired athleisure wear is designed with a stand-up collar, zip front and inner yoke and neck tape. Additional attributes include contrasting-color cover stitching on the front and back plus contrasting binding on the collar, sleeve cuffs, and body hem. The Tremblant Jacket is made of 9-ounce, 100% polyester sweater knit with a brushed back. The inner lining is 100% polyester brushed tricot knit. For additional comfort, the two side pocket bags and inner zipper flaps are also soft tricot knit. Available colors include metro blue heather, light gray heather, and black smoke heather. This logo athletic jacket comes in many sizes: S, M, L, XL, 2XL, 3XL, 4XL, 5XL and in both men’s and women’s styles, so that your entire group can feel “part of the team”. How did this great jacket get its name? Mont-Tremblant is a municipality in the Canadian province of Québec, set within the majestic Laurentian Mountains, northwest of Montréal. This warm and versatile sporting jacket would be great at any park while hiking on the forested trails, canoeing on the lakes, or enjoying winter activities. 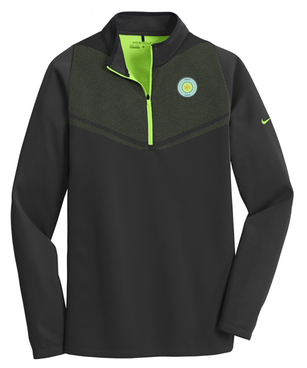 Add your embroidered logo on the 4”x4” imprint area of this sweater-like jacket and wait for all the positive comments about your brand while at open houses, cold-weather sporting events and more! 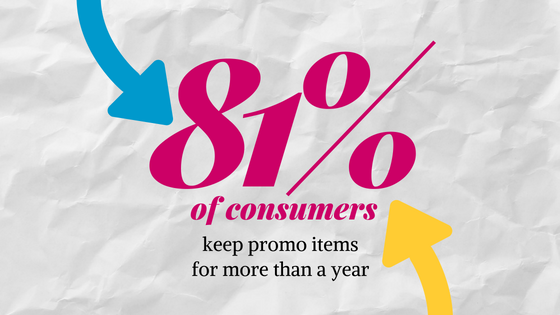 It pays to use promotional products because they can work for any brand. 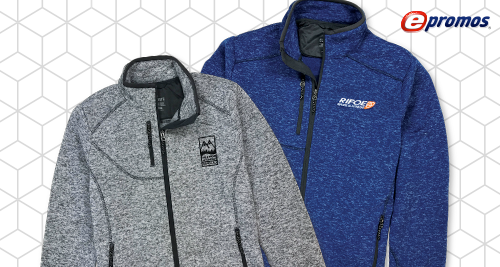 Choose the right custom athletic clothing for your business and “you’re ready to go!” Businesses can set themselves apart from their competitors by using the Tremblant Jacket for any campaign – to drive tradeshow traffic or to boost brand awareness. Browse all the colors and choose the one to get your logo in front of your target audience, make your brand known in the community, create a new customer base and show loyal customers your appreciation. That’s powerful stuff! At ePromos, we are passionate about our work – we take pride in establishing more successful businesses. Recently, our staff from ePromos attended the Promotional Products Association International (PPAI) Expo in Las Vegas. We had our eyes peeled for emerging trends and innovations in custom logo merchandise. This includes identifying the best-of-the-best products, and new decoration methods to help our customers’ brand look amazing and be effective with their marketing spend. 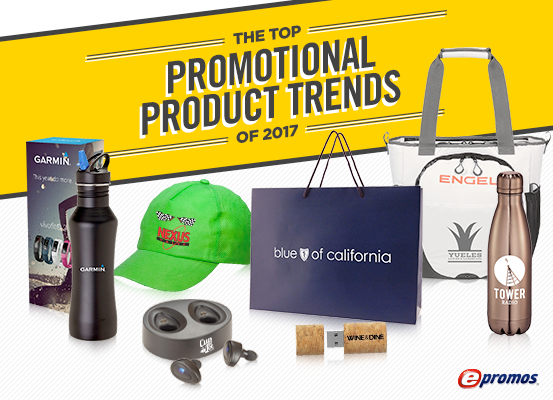 ePromos helped you find the best promotional items in 2016 – now check out our top ten trends in promotional products for 2017 below! 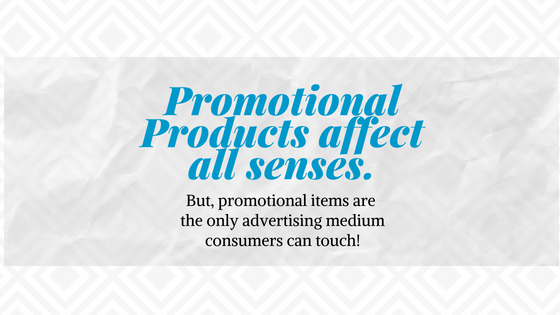 It’s referred to as the “retail effect”: the products you see on the shelves when you go shopping are now available as promotional products. Not only will you find popular brand names at ePromos, you’ll also find lower priced retail lookalikes that may better fit your budget. To garner more brand awareness, look to this latest trend. Retail-related products have a high perceived value and quality — and the quality of your product has never been more important. Even better, you can add to your logo to put your personal, unique touch on it. Take it one step further with retail packaging, which is a practical way to get more eyes on your logo! Aesthetically pleasing packaging will increase the perceived value of the gift you are giving. One of the biggest trends right now is copper. Try promotional products made entirely out of copper, or with copper accents and lining that adds to the performance of products. 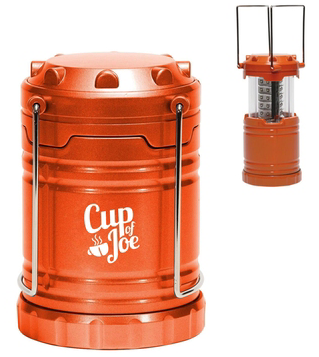 Copper used in drinkware adds insulation for extended thermal retention, keeping hot drinks hot and cold drinks cold for longer. Brand names to look for using the insulation qualities of copper are Grizzly®, and Pelican®. 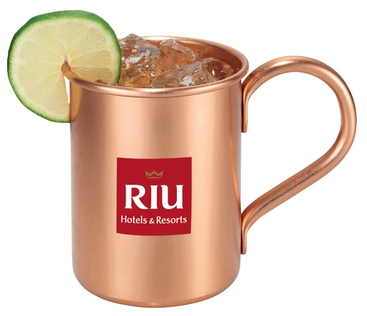 For the tasteful look of copper, check out our Copper Moscow Mule Mug, Copper-Insulated Tumbler to enhance the aesthetic of your at-home bar. Your customers will love Copper-Colored Water Bottles, which are a stylish piece to tote around the gym or town on a hot summer day. These trends are likely to remain for their fabulous look, their ability to fit any budget and their functionality. Not all that glitters is gold! Look for products that have this aesthetic — sometimes called powder coated. It’s an elegant, soft matte look that everyone is loving! This look is a new trend in promotional products, and an original idea that will help you successfully promote your brand. A powder finish absorbs light rather than reflecting it, so this finish reduces highlights and you can see more of the branding. Customers with discerning taste will appreciate these items because with a powder polish, you get the appeal of a different texture. 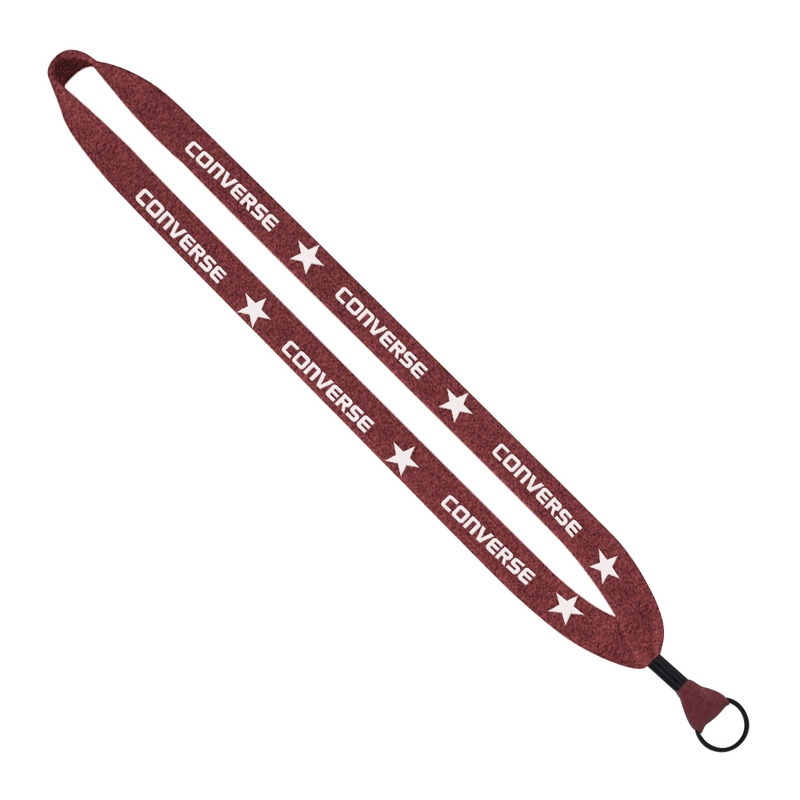 Many hot promotional items are getting a makeover with this trendy appearance. Today everyone is connected and dependent on gadgets, continually upgrading to current technology. That’s why useful technology products remain on our Top 10 list, especially Bluetooth-enabled products. Wireless earbuds allow the recipient to listen to their favorite music, book or podcast with cord-free convenience. Some features our collection of Bluetooth earbuds include: hours of playback time, volume control, built-in microphone, power switch, charging cable and earbuds easily pair with another device. Some of the best corporate gifts are ones that recipients can use both inside and outside of the office. New gear and gadgets are a valuable product that recipients will appreciate for a long time, keeping your brand on hand every day. Some of the best giveaways are when you keep your client, customer or employee’s personal interests in mind. For nature lovers and adventurers that often head outdoors, gift promo products that fit well into a rugged environment. Even products that simply remind one of the great outdoors are slated to be extremely popular in 2017, as they were showcased at the Expo. If your customers and employees lean more toward the rugged side of recreation, you can effectively advertise to those enjoying activities and relaxation that are a bit more robust. Fishing excursions, field days, team building expeditions, camping and boat shows, sporting games and more are perfect events to reach those individuals with a passion for the outdoors. Forget your run-of-the-mill standard promo items – outdoor gear are unique corporate gifts that will be sure to impress. Gear up the people you most appreciate with binoculars, coolers, survival products, chairs, picnic blankets and more. Endless printing will spice up your marketing efforts. To wonderfully represent your brand, try the newest way to create stunning full-color images that wrap 365 degrees around your product. The illusion created is that the image has no beginning and no end. 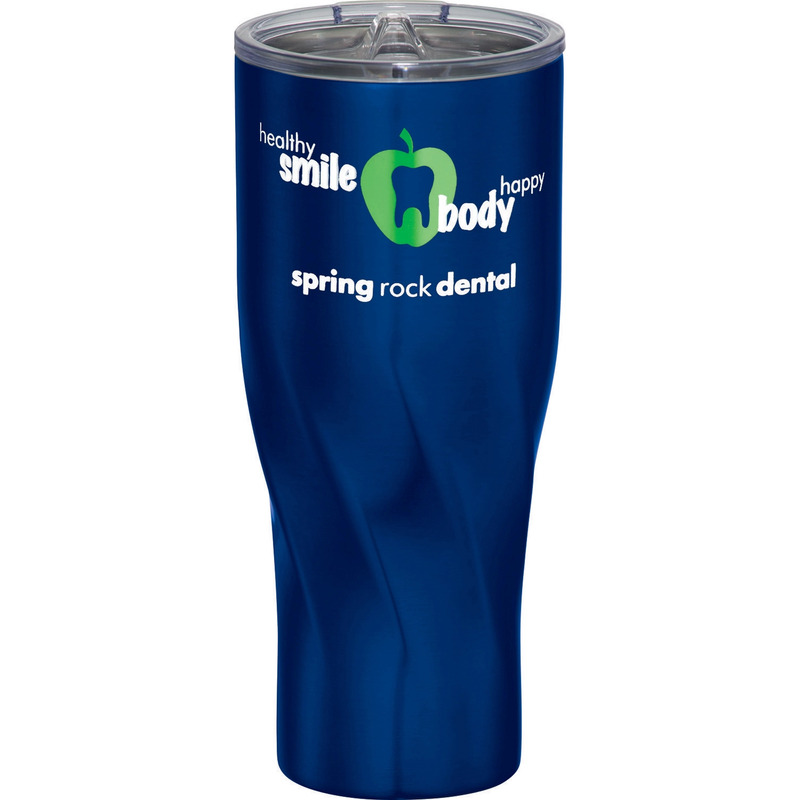 ePromos offers this unique option, so you can design your promotional products with artwork that wraps around the entire cylinder-shape of tumblers, bottles, glasses and more. Full-wrap printing creates an opportunity to expand on your overall marketing communication by using imagery that is seen no matter which way the product is turned. You can tell more of your story both visually and with text using this exciting new decoration method of printing. This seamless and continuous 360-degree design will change the way people are looking at your logo. Considering how everyone today is connected and dependent on gadgets, the trend of giving away Technology items is here to stay. In 2017, technology is still strong trend and “smart tech” is the favorite for B2B marketing. Technology that comes in handy when people least expect it reflects well on your brand. For useful items at work, home, play and information, look to the favorites: Power Banks, Bluetooth Earbuds, USB Drives, Stylus Pens and Bluetooth Speakers. You can plan on the tech trend to remain a trend because they are becoming more cost effective and “smarter” by the day. You can guarantee your brand will be seen because these products have the potential to be used on a daily basis. Virtual Reality is still hot for a smart tech gift. Hand out these goggles and you’ll transport your customers to anywhere in the world. You can speak to one of our Brand Consultants about making your very own VR application featuring your brand! 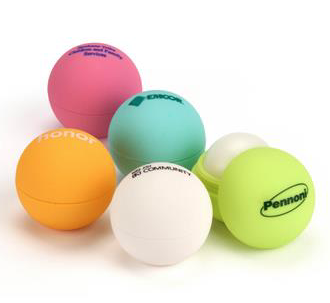 If you’re looking for one of the best trade show giveaways, look no further. Attendees will flock to your booth for quality smart tech gadgets. The next big trend that is sure to build a stronger relationship with customers and show your appreciation to employees is a soft-sided backpack. 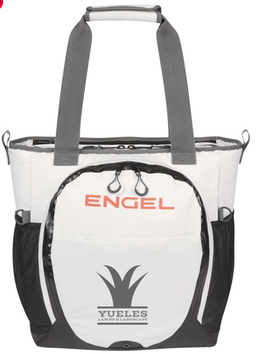 One of the best in the world is Engel…a legend in reliability®! 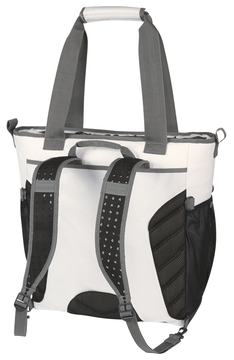 These rugged 23-quart personal carrying coolers can be a backpack or a tote and they have an endless amount of quality features. 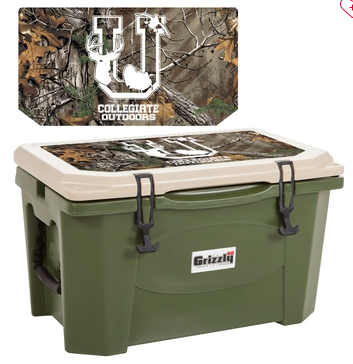 First, this cooler keeps anything cooler longer with one-inch thick foam insulation. Its interior radiant barrier liner reflects the sun’s long-wave heat radiation to further enhance the backpack cooler’s cooling capabilities. 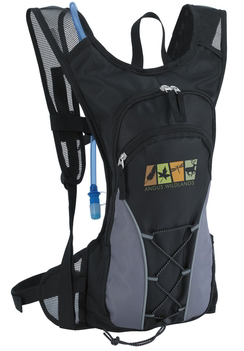 Under typical conditions, the backpack cooler will hold ice for up to three days. In addition, the liner is removable so you can get food easier and clean the bag. 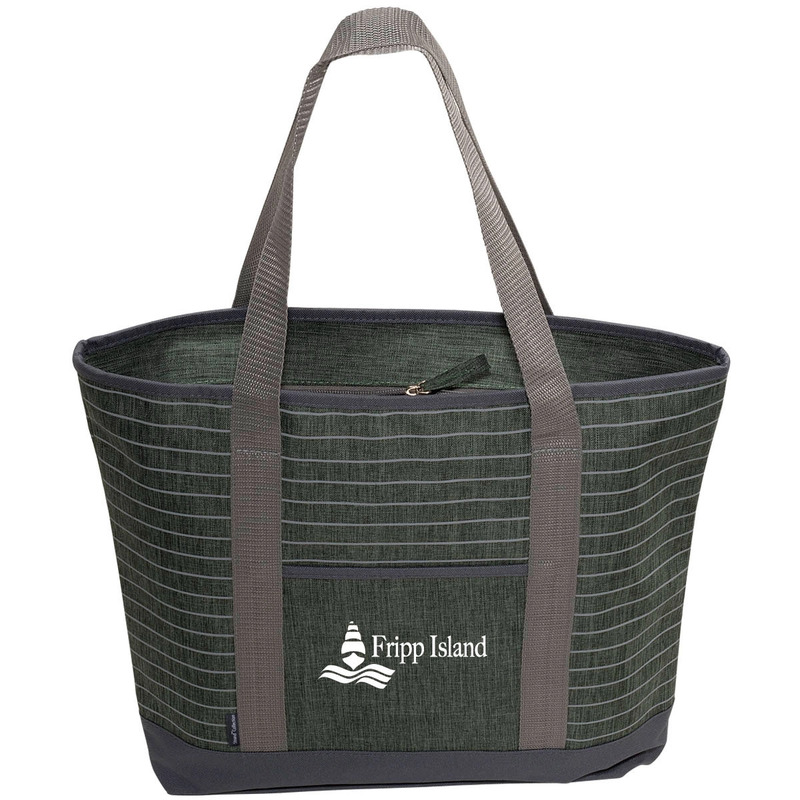 Made of 500D tear-resistant polyester, these totes can carry almost anything you want to keep cold. Plus, the waterproof TPE coating easily cleans up after any adventure. The reinforced bottom is flat with non-skid feet. These backpacks are unique gifts for employees, and a thoughtful way to remind them you care about easing their commute and making their lunch breaks more convenient. These backpacks are available in white or Realtree Camouflage for an additional fee. You also get to co-brand with a brand of excellence — Engle® is printed on the front pocket. We love electric bright colors and we’re happy to see that neon-colored promotional products are still a hot trend. No matter what product you want to promote your business, there are options that feature this neon trend and style to make your company stand out it a crowd. We encourage you to jump on the trend with bright fluorescent-colored pens, ceramic mugs, sunglasses, markers, drinkware, t-shirts, caps and other apparel. Brighten up your employee’s or client’s day with any one of these stand-out items. If you’re looking for cool giveaways and swag ideas, there was a ton of buzz at the show for Cork. Cork is the emerging trend of the year and one that is likely to remain in high demand in 2017. The great attributes of cork make it appropriate for promotional products. Cork is eco-friendly, durable, anti-microbial, doesn’t absorb moisture, and the shades of cork display beautifully. If you’re dying for an upscale look, check out our dyed cork custom merchandise. Uncork your imagination because your logo could be on drinkware, journals, USB drives, pouches and more. We offer a variety of cork-accented products at different price points, so this trend fits into any marketing budget. 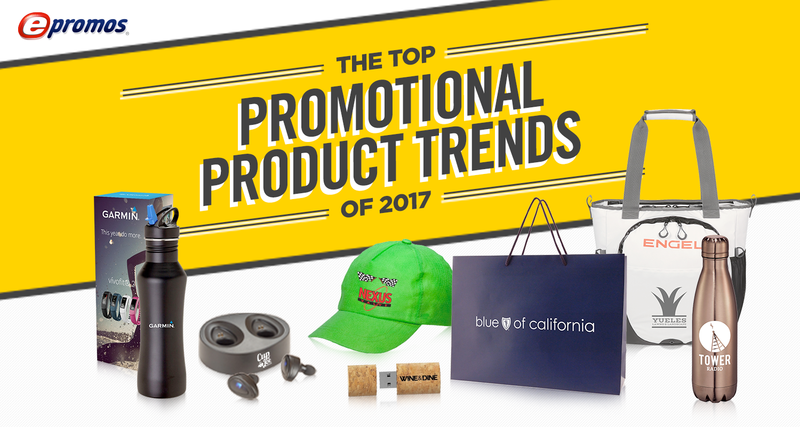 Take a tour of our promotional products to see all the products taking off in 2017. Choose any of these trendy products, and it’ll be a unique trade show giveaway that will certainly attract people to your booth. Whether you’re looking for a memorable, unique client gift, or want to get your brand name out there with personalized promotional products — you’ll find affordable, unique, colorful and universal ideas for your customers at ePromos. Shop our selection of 2017’s hottest, trendiest products today! All over our planet, people enjoy beautiful waters and beaches – canoeing, sailing, kayaking, paddle boarding, boating, surfing, jet skiing, swimming. Fun on the water is always an amazing adventure; however, remember with sun, sand and surf, you need to be safe on the water and in the water! You can bet if you are dusting off your flip flops and heading to the water, your customers and employees are doing the same! So, why not give your promotional campaign a water safety refresher? As a business, one of the best things you can do for a customer is to show them that you care about them and their families’ well-being. A gift of safety is a very good reminder of those feelings and a gift for water-front activities is just the ticket because they are appropriate gift all year long. The United States Coast Guard has requirements for safety equipment – basic items crucial in emergencies. However, there is other “equipment” that is not necessarily required by law, but may certainly keep the people we love safe or even save a life on the water. Here are water safety promotional products that should be a part of every adventure on or near the water. Recently, a waterproof promotional product was in the news when two young men called 911 after one of their kayaks sank on Lake Michigan. The call was possible because the cellphone was in a Waterproof Cellphone Pouch. Help arrived soon after the call and the young men were rescued. Many items you bring to the waterfront, besides your cellphone, need to stay dry. Giving a useful gift such as a Waterproof Dry Sack will keep towels, clothes, documents and cameras safe from the water. You can start your summer promotion off right with these perfect ideas for attracting customers. Another personal safety tool that is simple and extremely reliable is a safety whistle. The U.S. Coast Guard regulations state that if a paddle board is operated outside a surfing, swimming or bathing areas, they are “vessels” and operators must have a life jacket and a whistle. A safety whistle is an effective way for customers to be listening to your promotion while making sure they are heard in case of an emergency or to warn boaters in the vicinity. Whistles fit into any type of budget and could be the perfect choice for your customers. In addition, to stay legal on the water, the U.S. Coast Guard regulations state that if you’re on the water after sunset, you need to have a flashlight, or similar lighting device. 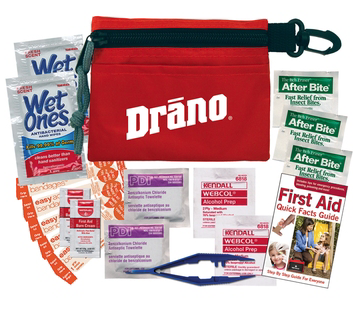 Safety also includes being able to easily handle small injuries, scrapes and cuts with the help of a first aid kit. Gauze, bandages, tweezers and antiseptic should make the trip every time you venture to the beach. So, if you’re looking for an easy gift appropriate for water safety and more – problem solved! 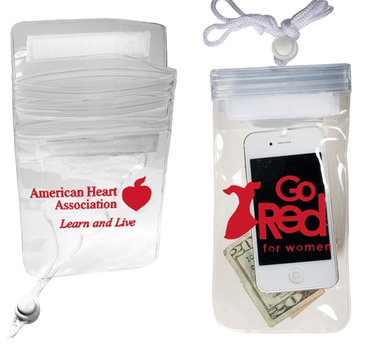 This is an affordable idea with a collection of protection that can be found in a variety of first aid kits customized with your logo. Fun on the water usually means sunshine. Too much sun can result in a painful sunburn or lead to more serious health issues including premature aging, eye damage and skin cancer. More than one million cases of skin cancer are reported in the United States each year. Your customers are free to enjoy time in the sun because you are helping to protect them from overexposure with a variety of carefully chosen giveaway ideas including: SPF30 sunscreen, lip balm with SPF, baseball caps, bucket hats and also UV protection/performance clothing. SPF 30 Promotional Sunscreen Spray – 1 oz. Keeping your eyes safe from the sun is important. The bright summer sun is a great time to bring out summer promo gear to protect your customers! Shield your customer’s eyes from harmful rays, whether they are on a summer vacation or simply spending the day in a boat. 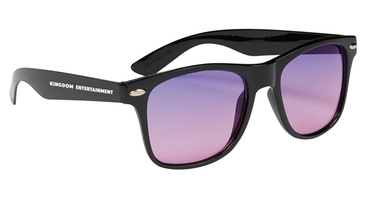 Give sunglasses away as a picnic favor, inside a summer festival gift bag or at a sporting event. Or, how about the wide canopy of an umbrella to keep away from the sun at a golf event, celebrity baseball game or field day excursion. Sometimes safety is as simple as staying hydrated. When it’s warm, people head outdoors to enjoy the weather. Dehydration can creep up quickly on hot days full of fun and action. Giving away water bottles will be a simple reminder to stay safe during outdoor activities. 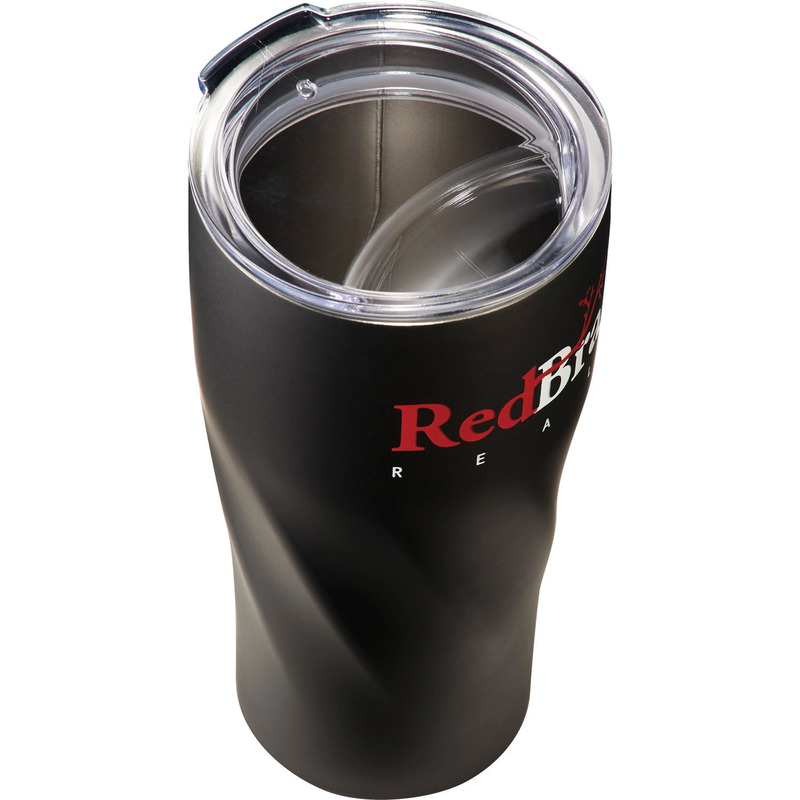 Drinkware is a practical and durable safety gift that will be used by customers and seen for months, providing you with repeated brand exposure. 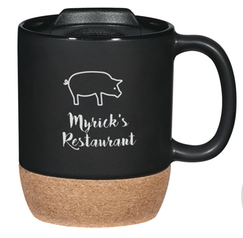 Matte Double Wall Custom Tumbler w/ Straw – 16 oz. These innovative products are simple and effective, plus they are an amazing way to show your appreciation for customers and employees. Wherever there is water and recreation, your brand will be in front of people who are in “enjoyment mode”…the perfect way to positively connect with your target audience with greater impact. From custom tote bags, to drinkware, to apparel…there are so many options for promotional merchandise it could literally make your head spin. While most companies are going to use promo item staples such as bags and pens, you don’t need to be boring. If you take a look at companies like Google, their promo choices are never boring – ever! If you want to stand out, make a statement and kick your competition to the curb, you have to step up your game. That is what working with ePromos is all about. Here is our most recent instalment of top trends to get you noticed and make your competition jealous. Inventors are constantly bringing us the latest concepts in branded giveaways and our merchandisers have their fingers on the pulse of leading-edge promotional products. Here is the Top 10 list shaping the 2016 promotional products landscape. You’re probably seeing these brightly colored custom inflatable loungers everywhere. Also known as breeze bags, wind couches, beach sofas and air chairs. 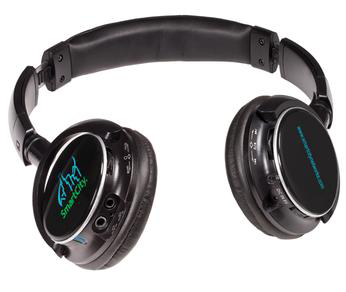 They are a retail sensation and now you can get them with your logo. Talk about impressing your clients. At home loungers are great outdoors or indoors: soccer games, movie nights, video gaming, sleepovers or instant extra seating that looks cool. Many of our clients are saying recipients love them at the office as a fun piece of extra furniture. Portable, waterproof, durable, and easy…just gather some air, roll up the end and clip – it’s ready to go in seconds. Unclip, rollup releasing the air and store in the drawstring bag. Your logo goes both on the lounger and the bag for great exposure. 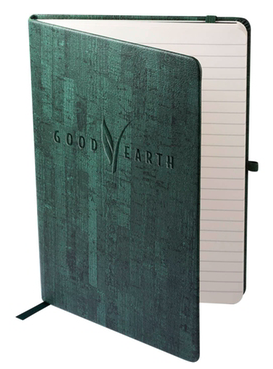 Go make your mark with this trendsetting product. Click here to see our video on How to blow up an inflatable lounger. Two of the biggest names in drinkware have made a huge impact in retail. Everyone wants one! However, there is no need to spend $30-$50 per tumbler on a Yeti or Swell. 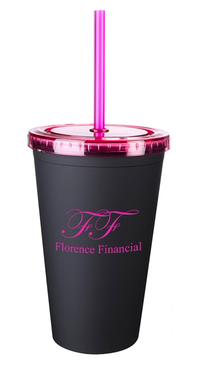 ePromos has similar high quality custom tumblers and you don’t have to pay the high price tag for a brand name. Depending on the drinkware you choose, these less expensive tumblers will also keep ice for more than 24 hours. Vacuum-sealed which means the temperature outside doesn’t conduct through to the liquid inside. Many of our items are sprayed internally with copper for extra insulation. 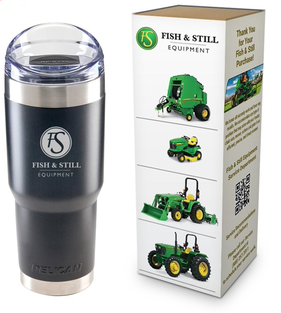 Insulated tumblers have become increasingly popular for coffee and tea, too…keeping beverages hot long after a morning commute. In addition, you don’t have to settle for just the stainless steel color and smooth texture, ePromos brings some style in a wide range of textures and colors to match your company’s identity.. 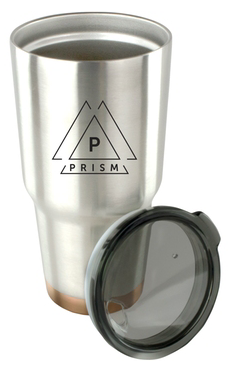 Stainless Steel Copper Insulated Custom Tumblers – 20 oz. 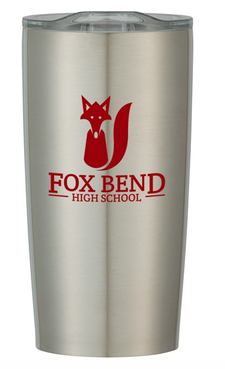 Stainless Steel Copper Insulated Custom Tumblers – 30 oz. Stainless Steel Double Wall Custom Tumbler – 20 oz. Virtual Reality Goggles are no longer a product of the future. Today your brand can exist on this futuristic product so anyone can experience VR and transport themselves anywhere in the world. Choose your favorite virtual reality app, slide a smartphone into these goggles (promoting your logo) and transform any cellphone into a virtual reality experience. Promote your brand at a low cost and you can order small quantities to make this cool giveaway even more affordable. Bluetooth technology is quickly making wired electronics a thing of the past. 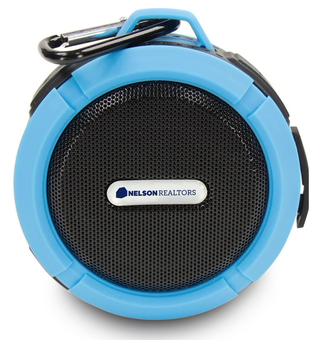 When customers need a bigger sound from their devices, you can gift them a quality speaker imprinted with your logo – an item with high perceived value that people will appreciate. Our current selection of custom Bluetooth speakers features over 80 items in a wide variety of shapes with carry-along features such as carabiners, straps, clips or hooks to secure the speaker. We even have multifunction speakers that also serve as chargers and sell from brand names such as Brookstone and OrigAudio. One of the most fashionable fabric trends this year has been heathered items. Traditionally custom apparel was the only promotional product where you found heather looks. Now this fashion favorite look of heather can be found in portfolios, lanyards, totes, caps, duffel bags and more. 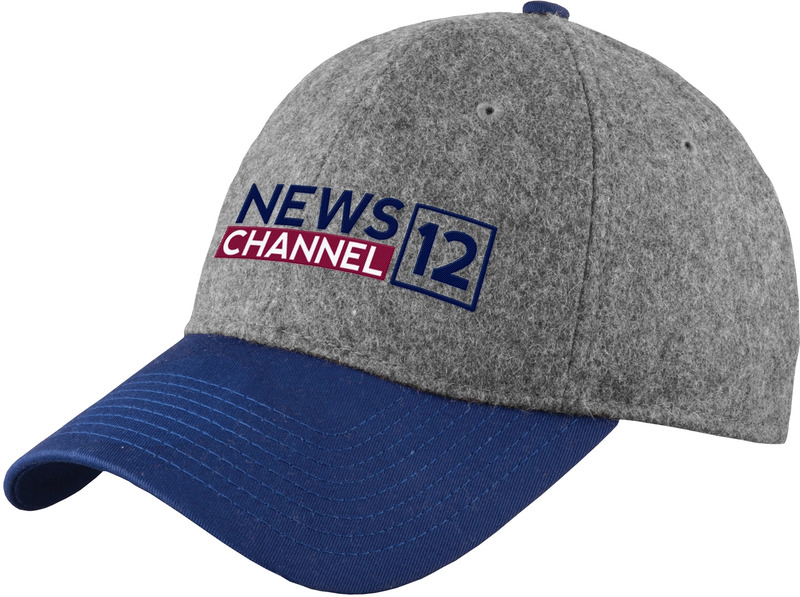 And, you’ll find colors beyond the traditional heather gray, we are using many base colors interwoven with white thread to produce muted shades to match your logo. Look for these hot new items at ePromos.com. The newest and coolest trend up there, literally is Remote Control Flying Drones. You’ll be making a difference with your logo on a promotional drone that you know is going straight home and creating backyard bonding with the family. Gifts that allow for family bonding are always effective. Drones will be the main attraction as the top prize at any tradeshow booth – talk about a conversation starter! Giving a drone as a gift will be an effective advertising tool as well as keeping recipients buzzing while your brand is taken to new heights. Personal fitness trackers are on the shelf at stores everywhere. ePromos offers brand name Fitbits with your logo and fortunately, we also have activity trackers at much lower prices so you can get your name on recipient’s wrist daily! Imagine your logo on the trendiest fitness technology in the industry. These fitness-aware devices not only keep time, track distances and display calories burned, these good health promoters will show your company cares about wellness. Jump on this trend to make your business stand out from the rest. Today, cellphone battery life is a lifeline. Whether it’s personal or business, people rely on cell phones every day…so you can bet your audience will find a cool charger imprinted with your brand very useful. ePromos suggests this custom charging kit to show your clients you are there for them. The kit includes a USB car charger, a USB wall charger and 3-in-1 charging cables. At 2.1 amps of power these work with tablets and charge smartphones twice as fast as typical 1 amp chargers. That’s power at clients’ fingertips…and your brand is there, associated with being a lifesaver too! Yes, Selfie Sticks are still hot! Reach out to your customers and promote an easier way to take a selfie. Favorite moments will be captured while you promote your brand with an ePromos customized selfie stick. Travel with your audience and capture the good times with the perfect picture…your logo is alongside the fun too!